anybody play with this yet? It is a 16 step 4ch rhythm machine using MegaDrive PCM. Number of patterns 4 Total 64 steps. Looks cool. I'm gonna check it out! This is a pretty cool program. It took me a while to figure it out since I couldn't find a manual. You need to set your emulator to use a 6 button controller configuration. Within the Start menu use the C button to select your options. In the Tempo selection Left and Right on the D Pad make the tempo go up in increments of one and Up and Down on the D Pad makes the tempo go up in increments of ten. You can go from 20 BPM up to 240 BPM. 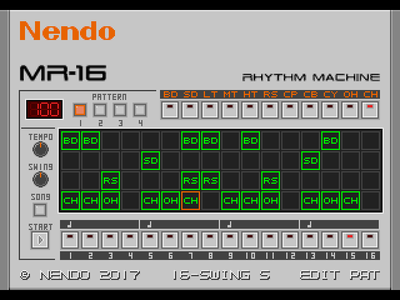 While in the Tempo selection C will change up the swing: Blank, 8-SWING, 8-SWING S, 16-SWING, and 16-SWING S.
In Song Mode the program will play through all four programmable patterns in a loop. The patterns have four voices so you can play four sounds on top of each other. There doesn't seem to be a save function at this time. Major kudos to the author who wrote this. It's a very intuitive user interface.